Joyce Longcore had all but given up on the flask containing a mysterious microscopic fungus from a frog leg sent to her by pathologists at the Smithsonian’s National Zoo in Washington, D.C.
For days, the mycologist had been trying to culture the fungus her colleagues thought was responsible for a mass die-off of the zoo’s young poison dart frogs. But in her lab, the fungus, from a group called Chytridiomycota (chytrids), was not cooperating. 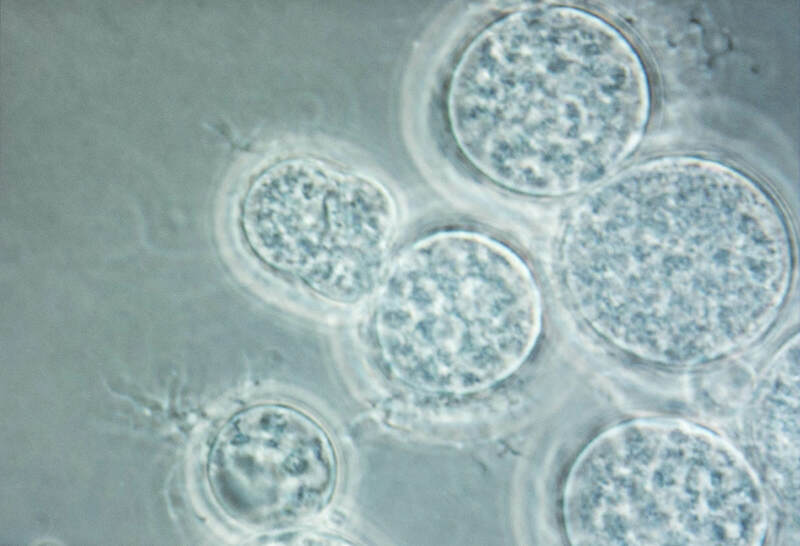 The organisms she was attempting to isolate into pure culture refused to form the zoospores necessary for reproduction. She was convinced the early growth was going to die, leaving many unanswered questions. Then, something in the flask changed. Overnight, the fluid containing the floating fungus sample, which had been extracted from the skin of a dead blue poison dart frog, went from clear to a kind of opalescent. Either the sample was contaminated by bacteria or the mysterious little chytrids had begun to grow. Looking at a drop of the solution on a microscope slide, Longcore realized that she had isolated a pure culture of a worldwide killer. The zoospores, rhizoids, thalli, and other structures and life stages of the chytrid were the first glimpse of the fungus in isolation and the cause of a new disease in amphibians. Until then, no species of chytrids had been known to be a pathogen of vertebrates. The day of the internationally important discovery: Oct. 13, 1997. Longcore’s birthday. Microscopic images of the chytrid Batrachochytrium dendrobatidis (Bd). “I knew that I had this organism that killed amphibians in pure culture, and that this made research on the disease organism possible,” says Longcore, who, along with her Smithsonian colleagues, was the recipient of a 2017 Golden Goose Award from the American Association for the Advancement of Science (AAAS). The Golden Goose Award recognizes the people and stories of unexpected scientific breakthroughs that are outgrowths from federally funded research — research that, at the surface, may have seemed odd or obscure, but that has gone on to have serious benefits for society. In 2012, Longcore was elected as an AAAS Fellow for her groundbreaking chytrid research. Longcore and her Smithsonian collaborators, Don Nichols, Allan Pessier and Elaine Lamirande, were honored at the sixth annual Golden Goose Award Ceremony at the Library of Congress in Washington, D.C. this past September. Longcore has studied chytrids for more than 30 years. Until the discovery of the lethal chytrid, her research had flown largely under the radar. Chytrids simply had not garnered much attention from anyone, let alone the scientific community. But the discovery of the frog-killing chytrid and its role in the mass die-offs of frog populations worldwide thrust her research into the spotlight. Longcore and her colleagues from the Smithsonian’s National Zoo named the chytrid Batrachochytrium dendrobatidis (Bd). And researchers simultaneously found that it was not only killing frogs at the National Zoo, but was ravaging frog populations around the world — from Australia to Central America — and has already driven dozens of species to extinction. Since the discovery of Bd, Longcore has collected hundreds of different strains of the pathogen from around the world — including Maine. Bd can be found nearly everywhere that amphibians live and it seems to have spread rapidly, largely assisted by human movement and the global trade of amphibians, some of which are silent carriers of the disease. 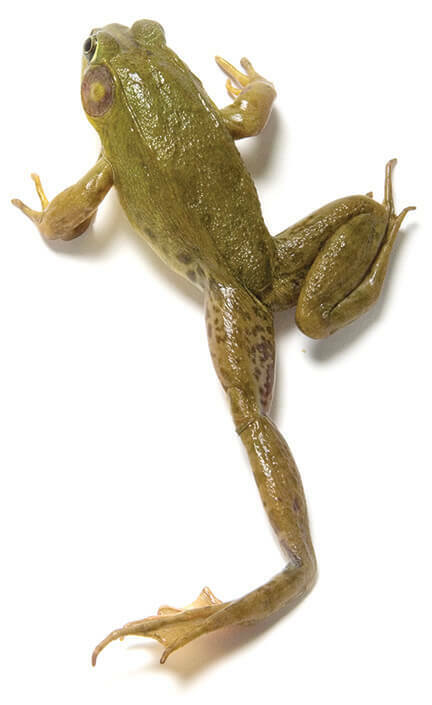 Bd now has been joined by a second chytrid species that can harm and kill amphibians. The recently described species, Batrachochytrium salamandrivorans (Bsal), is similar to Bd with the exception that it seems to infect only salamanders and newts, rather than all amphibians. Native to East Asia, Bsal arrived in Europe with imported amphibians and was discovered when researchers began investigating a large decline in Netherlands’ fire salamander population. According to Longcore, the U.S. Southeast is a hotspot for salamander biodiversity and if North American salamanders are susceptible to the disease, an outbreak of Bsal could be catastrophic. Longcore’s research didn’t stop with the description of Bd. She has isolated Bd from many places and collaborates with scientists all over the world. She sends them samples for a variety of research purposes, including molecular phylogenics, which, according to Longcore, is the next frontier in understanding the origin and distribution of Bd. She also consults with algae aquaculturists who are interested in aquatic fungal pathogens that attack their crops. At her UMaine lab, hundreds of different types of chytrids, Bd and otherwise, are cryogenically preserved in liquid nitrogen; her collection has been growing for decades. “I love a group of organisms called chytrids,” says Longcore, “much in the same way birdwatchers love birds. They’re beautiful and not a lot of people know what they are.